Not Your Average City Guide Site - We're a Proven Program! 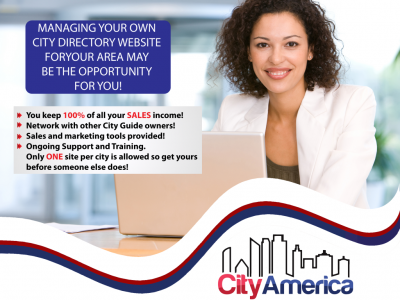 City America gives you the opportunity to manage your own city guide website – Ideal for work at home moms, retirees, second income or students! Want to run it full time? Even better! Our city guide software and program is the best value on the Internet. We offer the most features and the most flexibility for customizing your new business to meet your preferences. Our membership base alone shows we are superior to any competitors. Your City America Directory will help support your local business community and help improve your local economy! Make a difference in your community today! City America allows you to network with over 300 members! Only City America allows you to network with over 300 members to help ensure your success by sharing strategies. Meet every week on one of our conference calls, or every day in our forum. Learn from clients who have been with us for years how to make your site all you want it to be! Your Site is Exclusive! Only ONE City America website will be allowed for each city. Once you decide that YOU want to run the city directory for your city, NO Other City America sites will be allowed in your city. It is a first come, first serve opportunity. Currently there are over 300 active cities – is your city still available? Marketing Materials Included! Flyers, brochures, phone scripts, sales agreements, and much more. See our website for details and examples.